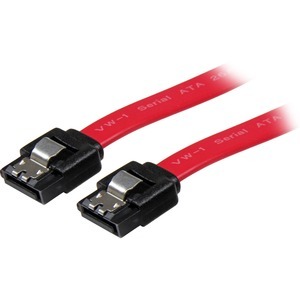 These latching Serial ATA cables guarantee you'll be able to plug in your high-performance Serial ATA hard drives, no matter how tight your space is. Latching connectors provide secure connections for SATA hard drives and motherboards that support this feature. With their thin, narrow construction, these flexible cables improve airflow and reduce clutter in your case, helping to keep your case clean and cool.